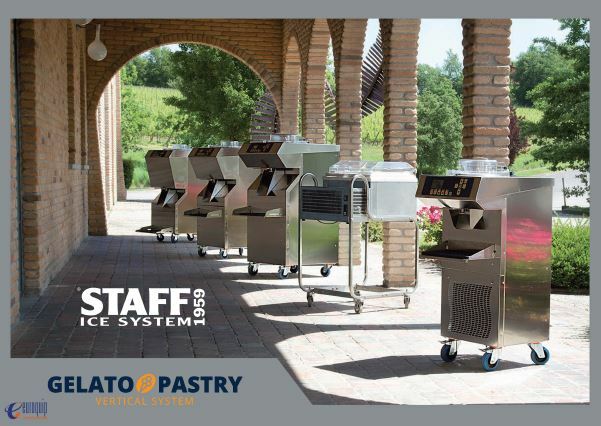 Staff Ice System , Italian brand founded in 1959, produces gelato machines and more in general catering equipment for the production of many products related to the gelato and pastry industry, like gelato, semifreddo, cakes, slush/granita, ice cream mix pasteurisation, custard cream, choux pastry, gelatine, jams, marmalade, yogurt, pannacotta, mousse, marshmallows, fresh cheese, béchamel sauce, rice for pastry, risotto, polenta, sauces, ragù sauce (meat sauce) and much more. Staff Ice System has always valued constant research, development, design and a high level of respect for the environment. These values have caused Staff Ice System to grow as an organisation, develop and expand throughout the world whilst overcoming difficulties in an increasingly competitive market. With over 50 years’ experience, a passion for professionalism, the introduction of a new generation, great enthusiasm and a modern mentality Staff Ice System are set to continue their success well into the future. Staff Ice system were introduced to Australia at Fine Foods Exhibition in Melbourne in September 2014 with their range of gelato equipment, ice-cream machines, multi-function machines and cold storage cabinets. The constant investment in research and development, in planning and finding the best design, have always been the company’s philosophy. This premium catering equipment let your creativity express in its best way, allow you to make what before wasn’t even possible to imagine! The real innovations produce long-lasting effects because they positively influence the future, just as the ones you can find in Staff Ice System’s line, in comfort, safety and prestige field. The result? All the gelato machines made by Staff Ice System are a focus standard in gelato/ice-cream, pastry and catering world. The Inverter technology, designed in collaboration with TOSHIBA, allows you to control density with unique features and, most of all, allows you to act directly on the overrun, by adjusting the agitator’s speed to have gelato/ice cream and semifreddo with different volumes. Moreover, it preserves the mechanical transmission and optimises the electric motor’s power consumption. Easy to use in its standard functions, every machine by “Staff” represents a huge resource for the gelato/ice cream maker, the pastry chef and the caterer: the perfect integration between base electronics and the Inverter allows you to work on any kind of mix, as made by hand.